150th Anniversary of The Battle of Gettysburg Sale! Tomorrow marks the 150th Anniversary of what most consider to be the turning point of the American Civil War: The Battle of Gettysburg. Fought from July 1-4, 1863, the battle involved the largest number of casualties of the entire war at close to 50,000. The Washington Post is running an excellent series on the Civil War's anniversary that details the major events leading up to Gettysburg along with excellent battlefield maps and resources. Of course, even more memorable than the battle to most Americans is President Lincoln's Gettysburg Address that November. A dedication ceremony was held then for the Gettysburg National Cemetery to honor the fallen Union soldiers. Lincoln's brief words there redefined the purpose of the war and what it meant to be an American. In honor of this great anniversary, my gorgeous, visually-engaging Battles of the Civil War PowerPoint that covers the resources of both the North and South, essential knowledge about each Civil War battle, and the results is 50% off through July 4th weekend! 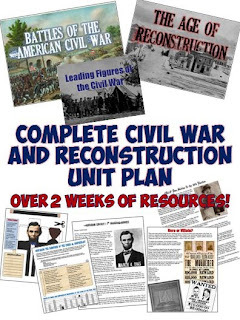 Additionally, this brand new Civil War and Reconstruction Unit Bundle is on sale as well! 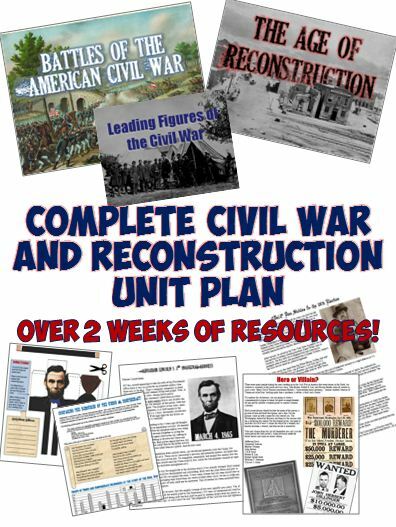 This incredible set of resources to teach the Civil War and Reconstruction includes 3 amazing PowerPoints, a film guide, primary sources, activities, projects, and worksheets! Priced individually, this would be over $30 worth of resources but will be on sale for just $15 through the end of July 4th weekend! Thanks for looking and I hope everyone has a wonderful Independence Day weekend!! This wonderfully creative lesson has students creating pop up figures of 4 of Europe's Absolute Monarchs: Louis XIV, Philip II, Czar Peter the Great, and Henry VIII. Included is a sheet with the 4 cut outs of each monarch and a graphic organizer map with spaces for notes about each person. A 17 slide Powerpoint covers everything students need to know about the causes of Absolute Monarchies, Divine Right, and each Absolute Monarch based on Common Core Standards. This lesson is amazing for your visual and kinesthetic learners as they are creating a fantastic visual representation of Monarchs literally rising up out of their notebooks! As a teacher, as much as I like to relax and unwind over the summer, I also try to set aside some time to deepen my content knowledge through a good book, course, or curriculum project. U.S. History: First Peoples to the Civil War and Reconstruction through Seattle Central Community College - Dr. Weston examines U.S. History from European settlement to the end of Reconstruction. Hope you find some of them useful! Enjoy your summers! Instagram has always been known as a great way to share pictures with friends and family. I was hesitant if it would be a good way to share images of some of the resources I've created, but figured why not give it a shot! I've always prided myself on creating visually beautiful materials for education that engage students, so hopefully these images translate well to Instagram! Be sure to follow for special updates and resources for history! You can find my Instagram by clicking on the badge below! Well, next week marks the last week of school for us, though I'm sure that some schools are finishing this week or even going a little later. It's such a hectic time of year with kids frantically trying to turn in work and do anything they can to bring up their grades. For all the teachers who come across this blog I wish you the best as you finish up the year. I will post periodically throughout the summer and will be working hard to add more great resources to the store and get things even more organized. Thank you to everyone who has read this blog and used Students of History resources. I appreciate you all so much! Happy Summer!